Subtropical forests in montane ecosystems grow under a wide range of environmental conditions. However, little is known about the growth responses of subtropical trees to climate along ecological gradients. 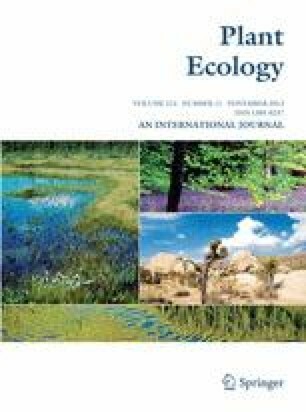 To assess how, and to what extent climate controls tree growth, we analyzed tree responses to climate for 15 chronologies from 4 different species (Schinopsis lorentzii, Juglans australis, Cedrela lilloi, Alnus acuminata) across a variety of environments in subtropical forests from northwestern Argentina (22–28°S, 64–66°W). Using correlation and principal component analysis, site and species differences in tree-growth responses to precipitation and temperature were determined along the elevation gradient from the dry-warm Chaco lowlands to the wet-cool montane Yungas. Our results show that species responses differ according to the severity in climate conditions along the elevation gradient. At sites with unfavorable conditions, mainly located at the extremes of the environmental gradient, responses of different species to climate variations are similar; in contrast, at sites with relatively mild conditions, tree growth displays a large variety of responses reflecting differences in both local environmental conditions and species physiology. Our research suggests that individualistic responses to environmental variability would determine differences in the type and timing of the responses of dominant trees to climate, which ultimately may shift species’ assemblages in montane subtropical regions of South America under future climate changes. Authors wish to thank to “Rana” Ledesma, Mariano Morales, Gualberto Zalazar, Facundo Rojas and Parque Botánico Municipal Jujuy for field and technical assistance, and Nélida Horak for English revision. Silvia Pacheco (Fundación ProYungas) provided ecoregions’ shape files. This study was supported by the Argentinean Agency for Promotion of Science and Technology (PICTR02-123), the Argentinean Council of Research and Technology (CONICET), and the Inter-American Institute for Global Change Research (IAI) CRN 2047. We thank Chris Lusk and two anonymous reviewers for comments that greatly improve the manuscript.